You know that ridiculous question, "What's your five-year plan?" Well, I think it's ridiculous. Who plans five years ahead? Certainly not me. Five years ago, I pushed the go button for Knitty and look what's happened since. I'm very happily self employed making this magazine for you, I love my job and get to work in my pyjamas if I want to. And I often want to. I also don't have to keep track of how many sick days I've used, which is a good thing. See, in early August, I awoke in the middle of the night in quite horrible pain and four days later, my gall bladder was in a trash bin. But August is fall Knitty production month. "Sure," I told Jillian. "I'll be able to work when I get home. I just have to sit at a desk." Silly me. I had no idea the abuse a belly button suffers in laparoscopic surgery [you don't want to know either], and clearly was misguided about my ability to remain reasonably vertical post-surgery. It took more than a week till I even had the energy to check my e-mail, and that's saying something. So Knitty is a few days later this issue than normal, and I thank you for your patience and for waiting for us. I hope you like what you see. This fifth-anniversary fall issue is full of extra-special gall-bladder-free editorial goodness. And as my friend Jen Hendriks told me, "I really think that gall bladder was holding you back." Please we need your help to fight breast cancer! Cool-weather Knitty swag is ready for you. Are you ready for it? Come in and take a peek! Too soon to talk 2008 vacation? I don't think so! I think you should join me, Mama E [the charming goddess of hand dyed yarn], Chrissy Gardiner [fab knitwear designer] and Brenda Dayne [host of Cast on and the patron saint of knitting] next May as we cruise and knit and have a great time on the way to Alaska! 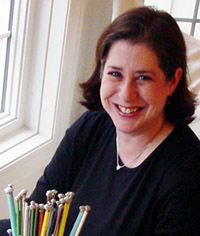 Look forward to classes with all of us, knitting onboard and off, knit-focused excursions and a killer goodie bag. Full details are here. I am pushing for at least one pajama knitting party on deck. We'll have to see how cold it gets! I think there's no better way to go with the flow than on a beautiful ship that takes you from port to port. Unpack once and watch as your home moves through blue waters populated by icebergs. I can't wait. Join me! It's fall. School and thoughts of learning have taken over the world. Amy and I and a bunch of other spinners are soon off to SOAR – the Spin Off Autum Retreat, or as I refer to it Spinning Camp. We will stuff our brains full of spinning learning at the hands of some of North America’s greatest fiber folk. I’m not a great technical spinner, and probably never will be, but I love spinning. The approach of SOAR makes me think about how I learn knitting and spinning differently, and how they occupy different season for me. With knitting, I am obsessive. If I want to know about decreases, I will sit for days with books piled around me, swatching and trying, what works and doesn’t. I don’t like to learn knitting from people. And don’t try to touch my knitting if you are teaching me something. Very isolated. Satisfying, but not always relaxing. With spinning, it’s different. Unless I’m totally and completely stuck, I never pick up a book. I go with trial and error and intuition. I love to learn spinning from other people. I love the chatter and the flow of a spinning class. 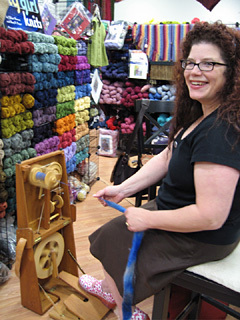 It doesn’t bother me at all when a teacher reaches into my spinning to tweak or twist my yarn – it's all Kumbaya all the time with spinning for me. Intuitive and relaxing. Winter is about learning knitting, combating that trapped-in-the-house-must-learn-something-new feeling. Fall is my learning spinning time. The kids go to school and, so do I behind my wheel, letting it flow.